Hey, y'all! I feel like I've experimented with a lot of different crafting techniques, but I'm always interested in new crafting experiments. One thing I've never done before is to engrave glass. I mean, just the thought of trying to engrave something that can break so easily is a little intimidating. I recently received a Dremel® Micro™8050, which can cut, carve, engrave, sand, grind, sharpen, clean and polish. Of course, I just had to use the tool to try out engraving glass. 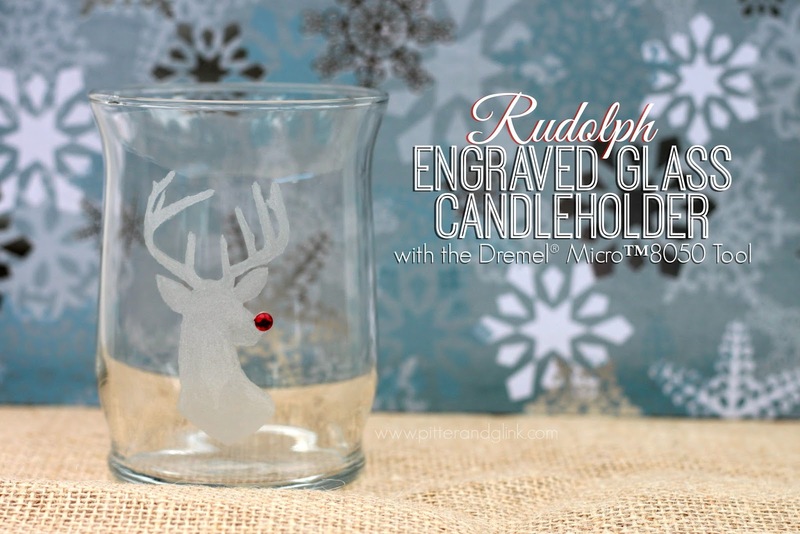 I was able to easily I create a cute Rudolph candle holder utilizing my new tool. 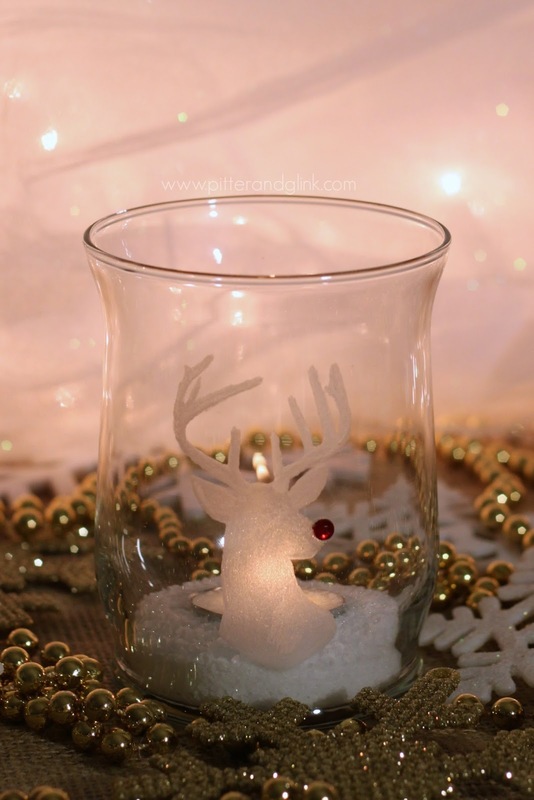 You need minimal supplies to create your own Rudolph candle holder, and you can complete this project in less than an hour, which is great for the busy holiday season. Dremel® Micro™8050 --The tool comes with different accessories. You need to attach the engraving accessory. I found the candle holder I used at the dollar store, but you could also check thrift stores or yard sales. The deer silhouette image I simply found by doing a Google image search. 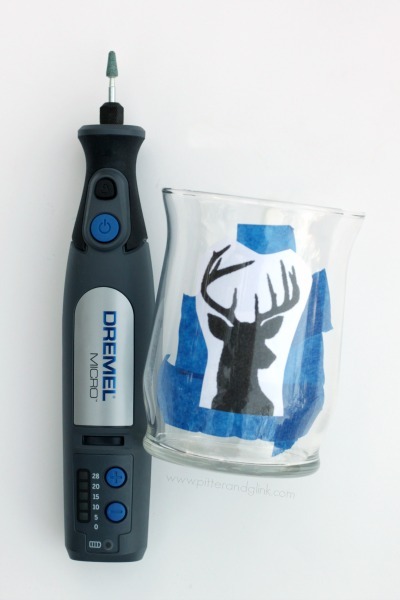 The very first step to create your engraved candle holder is to cut the printed deer Silhouette to fit your candle holder. Then tape it on the inside of the glass where you'd like your image to be. Next, start engraving. I know, I know. It sounds like it's really hard, but, y'all, it's not...AT ALL. The Dremel® Micro™8050 is packed with features that have crafters, hobbyists and DIYers in mind: soft grip, LED front-end lighting to illuminate projects, a docking station that continually charges, and an 8V Max Lithium-ion battery. The LED light illuminates the glass and the image that you're engraving, and the tool is light and really easy to hold comfortably, which is important for someone like me with small hands. Hold the tool kind of like you would a pencil (the directions with the Micro show you how) and engrave side to side or up and down or use a combination of the two. You really don't have to use much pressure at all because the tool does all the work. 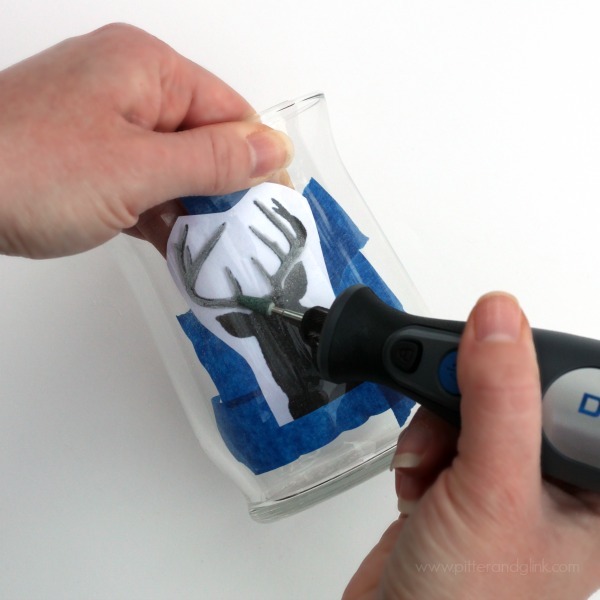 Once you think you're finished engraving, remove the printed image from the glass. Hold the glass to the light to see if you need to soften any edges or make another pass over the engraved image. 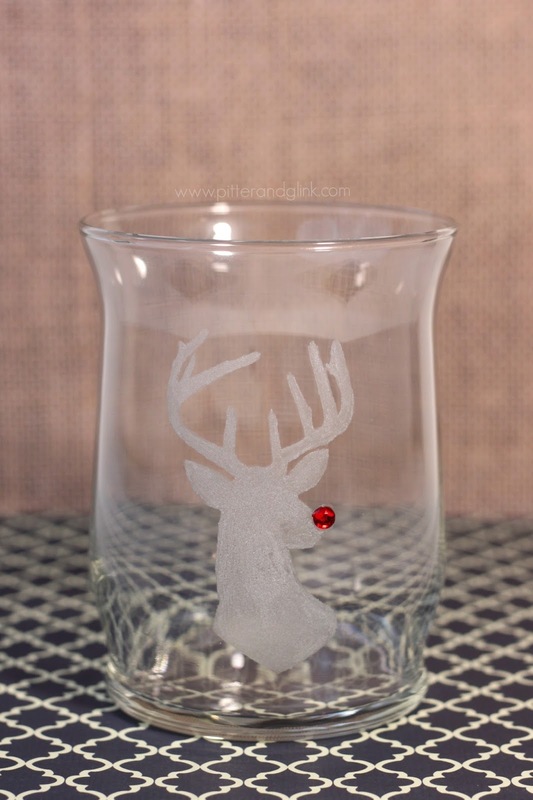 Once your deer silhouette is engraved on the glass, you need to attach a red rhinestone for the nose; it is supposed to be Rudolph after all. 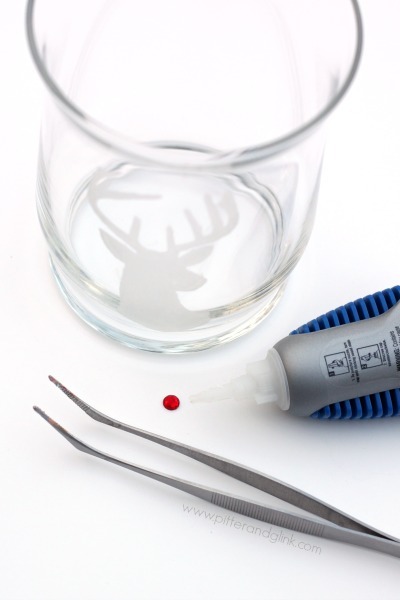 Use super glue or another strong adhesive to attach the rhinestone to the deer's nose. And then? Your candle holder is complete. I told you it was a quick and easy project. The candle holder looks great during the day. But it looks even better at night with a votive shining behind Rudolph. The Micro 8050 made creating this project so easy! You can buy your own online or in stores at Home Depot and Lowe’s or at Amazon.com for $89 USD. And for more information on Dremel products, project ideas and problem-solving tips, visit www.dremel.com. Wow! It's gorgeous! 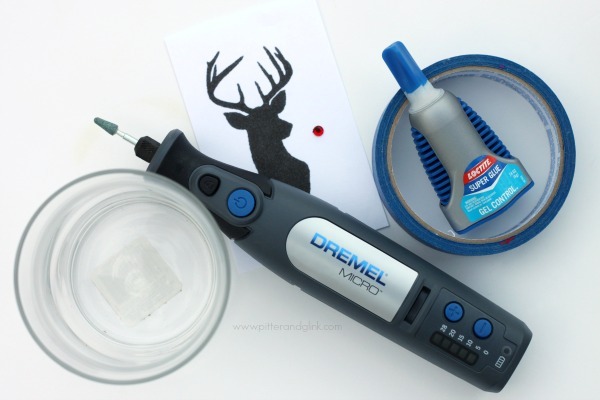 I have the Dremel Micro...now I want to try this! You should really consider making videos for some of your tutorials. I think it would boost your following and give us visual people some motivation to get some projects done. =) I love this one! Now I want to start engraving glass...if I could manage to work that in somewhere between my 9am-5pm and my sewing from 5pm-3am, LOL. SO pretty!! Can't wait to try it out soon!! This tool is amazing and seems so easy to use. Your engraved deer and red nose is precious! Beautiful. I like this idea wayyyy better than using etching cream which is far from perfect. You are going to get me in trouble, my sweet friend!!! I have a wish list about a mile long of projects I want to try that are from your blog!! I think I may need to bump this one to the top of my list. I love what you did and have a gazillion ideas floating around in my wee little head. As always, thanks for sharing. This is so cute, Bethany! And you ENGRAVED it! I didn't even know that Dremels could do that! I am definitely going to want to try this out.... so awesome! Wow! That is awesome! I REALLY want to give it a try! Your projects are always so fantastic. That is a great project. That Dremel can do so much! This is so cute and that tool sounds amazing! Engraving, and a dremel tool in general, sound so intimidating. You make it look so easy, thanks for the tutorial. OH my goodness! This is so stinking adorable! I love it! Super cute! Thanks so much for sharing at the Create & Share Link Party. Hope to see you again tomorrow night (7:00 PM MST)!